The Elizabeth neighborhood has seen its share of change in recent years, much of it not for the better. Philosopher's Stone, Jackalope Jacks, Kennedy's and VisArt are just a few of the area's staples to have shut down or moved away over the last three years. The Queen of the neighborhood, however, is not going anywhere. 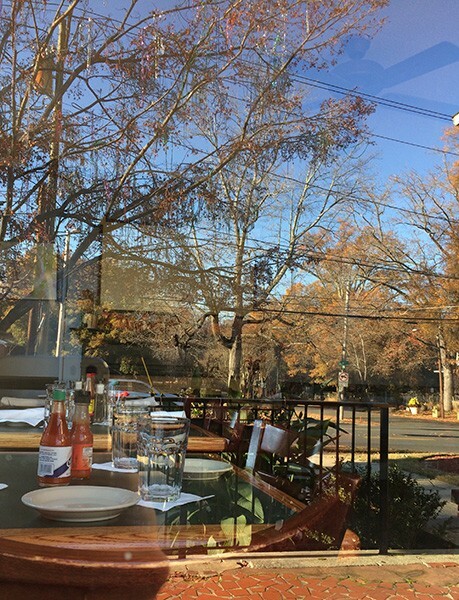 Cajun Queen, located in a nearly 100-year-old house on East 7th Street, has been a Charlotte staple for generations. Since 1985, the restaurant has been serving up bayou favorites like crawfish etouffee, blackened catfish and seafood gumbo while live bands infuse the old house with New Orleans ambiance. The restaurant's origins aren't, in fact, rooted in a Lowcountry heritage. Instead, the restaurant opened as part of a countrywide trend, and then it stuck around due to its popularity. In the early 1980s, cash was flush in southern Louisiana thanks to an oil boom in the Gulf of Mexico. Restaurants opened left and right, serving food that no one outside of Louisiana had ever heard of: Creole and Cajun. In terms of cuisine, "Creole" typically referred to urbane fine dining and nodded to the French and European heritage of the region's wealthy residents. "Cajun" shares that French heritage, but refers to the traditional dishes of the Acadian people who lived in the countryside and often had to make do with less. Cajun has come to be associated with fiery spiciness, but authentic Cajun food is less spicy and more spiced, featuring bold and complexly layered flavors. Some put it this way: Creole cooking feeds one family with three chickens; Cajun cooking feeds three families with one chicken. Paul Prudhomme, who was raised by sharecroppers in Louisiana's Acadiana region, opened a diner in New Orleans' ritzy French Quarter in the early '80s. There, he served the traditional Cajun dishes of his childhood, but was quick to innovate and put his own creations on customers' plates. One technique he devised was blackening. His blackened fish soon became a bestseller and, to his own dismay, outstripped his favorite Cajun dishes. Prudhomme and his restaurant, K-Paul's Louisiana Kitchen, gained worldwide acclaim and the chef is credited with popularizing Louisiana cuisine. In the wake of his success, restaurants boasting authentic Louisiana food opened across the country and provided a flavorful new alternative to traditional European fare. 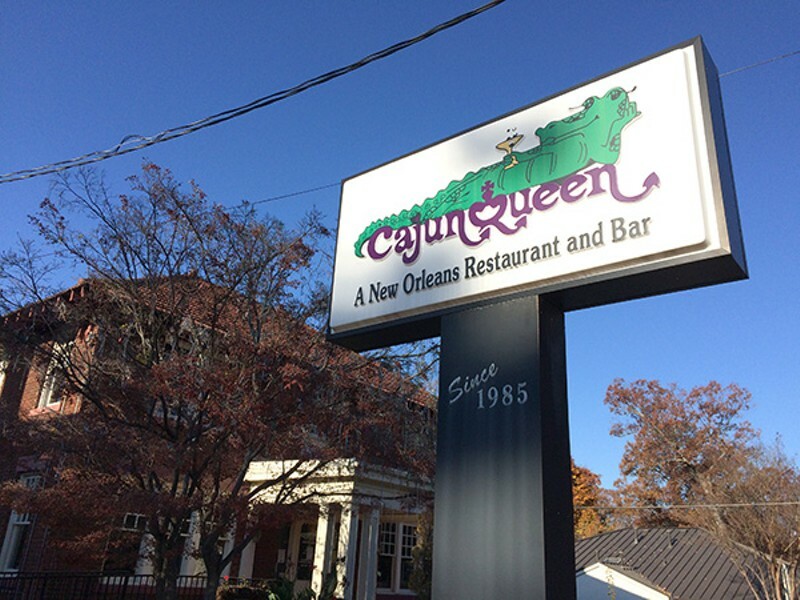 In Charlotte, Sid Gottfried capitalized on the nationwide trend when he opened Cajun Queen. He had competition. Just down the street, Bayou Kitchen also opened for business. Gottfried and his chef Howard Winter, who was trained at Johnson and Wales University in Rhode Island, ensured that their product was a cut above by prioritizing consistency and authenticity. In 1990, Gottfried sold the restaurant to his son, Robert Gottfried, and Winter, who remained partners for more than two decades. After Winter retired about a decade ago, he passed the baton to his right-hand man, chef William Wessling, who had been in the kitchen since day one. Today, Wessling is still Cajun Queen's chef and part-owner of the restaurant. Just after Sid Gottfried sold the restaurant to his son, a young barback, Tim Freer, reported for his first day of work behind the bar. As vacancies opened, Freer's responsibilities grew, eventually to the position of managing partner, which he is today. He grew up at Cajun Queen, and he's seen others grow up there, too. Once, one of his regulars told him she was pregnant. He later hired her son. Since the beginning, Cajun Queen has been located in the same old brick house on 7th Street at the corner of Lamar Avenue. 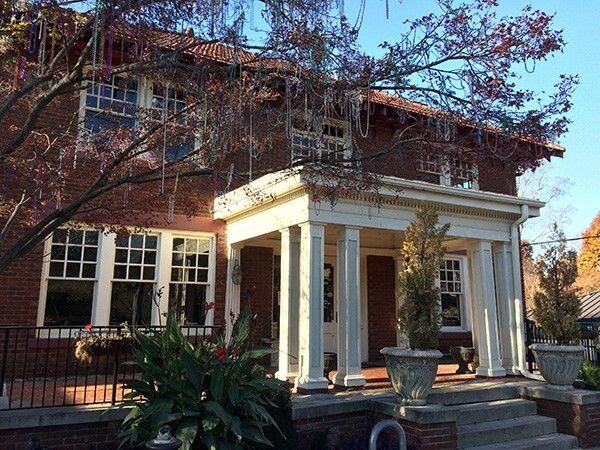 The house was built in 1918, just a few months shy of a full century ago. Like its location, the menu has stayed consistent. Save for some popular specials that have earned a spot on the regular menu, the food options have changed very little over the last 32 years. However, while things have stayed the same in that centenarian home, Freer and his Cajun Queen family have borne witness to plenty of change in the neighborhood and beyond. Freer says Cajun Queen used to have a symbiotic relationship with the bars at the eastern end of 7th Street — patrons would eat at the restaurant then walk down the street for drinks at one of the watering holes. But now, as those bars have closed or moved elsewhere, Cajun Queen has tried cultivating a similar relationship with bars farther afield, like Plaza Midwood, less than a mile away. The restaurant's location is also just a stone's throw from the massive construction project that has shut down the Hawthorne Lane bridge over Independence Boulevard and wrought havoc on businesses in the vicinity. Catch On Seafood Market, for example, shut its doors in October, with the owner citing the construction as a major factor. But Freer hasn't been too worried about the road closures affecting Cajun Queen's business. "We are a destination," he says. "If people are coming to the Cajun Queen, they'll find a way." Freer adds that locals sometimes visit Cajun Queen for the first time because their guests from out of town suggest it. In addition to local celebrities like Cam Newton and Luke Kuechly, the restaurant has hosted famous guests from all over the world, including Gloria Gaynor, who sang at the restaurant once, and one of the Sherpas who has summited Mount Everest more than any other person. Freer takes pride in Cajun Queen's less famous clientele too. He points out that the restaurant hosts Charlotteans and visitors of all backgrounds. People come for their bachelor or bachelorette parties, and people come for their 65th wedding anniversary, he says. Freer credits the restaurant's success and its wide-ranging appeal to three factors. "It's the house, the music and the food," he says. Since Cajun Queen opened, the restaurant has featured live music on a regular basis. Today, you can watch musicians play upstairs seven nights a week. One Yelp reviewer helpfully advises that upstairs at Cajun Queen is a perfect venue if you're going on an awkward date or having dinner with someone you don't like very much — the music will drown out the conversation. But for those interested in close conversation, the restaurant's homey downstairs rooms provide an appropriately quiet and intimate setting, with the upstairs vibes still audible, but at the perfect volume for a personal chat. Speaking of Yelp reviews, Freer says that Chef Wessling has a saying: "If you didn't like something last time, don't order it again." The chef and his staff take pride in the consistency that's made Cajun Queen a staple. At 5 p.m. on a Thursday, the restaurant's staff chats downstairs while rolling silverware, and the kitchen is noisy with preparation. Upstairs, Robert Gottfried's niece Hanna Bruskin angles the barstools just so and slices fruit that leaves a puddle of juice on the cutting board. When Freer asks her what her favorite thing about the restaurant is, she says it might sound stupid. "It's the beads in the tree out front," she says. The restaurant has a tradition of giving children Mardi Gras beads to toss up into the branches of the pair of trees out front. If the beads stay in the tree, a wish will come true. The higher the toss, the bigger the wish. Growing up around Cajun Queen, Bruskin says she would be excited at her opportunities to make wishes and throw her beads in the tree. Today, the branches are still decked out. "It's home for me," Bruskin says. Since the 1980s, the Cajun and Creole traditions have blended somewhat, and Cajun Queen's menu features hallmarks of both. But regardless of the dishes' specific origins, the menu is undeniably Louisianan. Inside, the walls are tastefully decorated with photographs and memorabilia of New Orleans. But in a corner by the bar, there's also a nighttime photograph of Uptown Charlotte. As the sounds and smells of New Orleans start to waft through the dining room before the night's first customers arrive, the photograph is a little reminder that while the food may come from authentic bayou recipes, the recipe for Cajun Queen's success is thoroughly Charlottean.